We all have an interesting story to tell, but it’s interesting only when we share it with others. 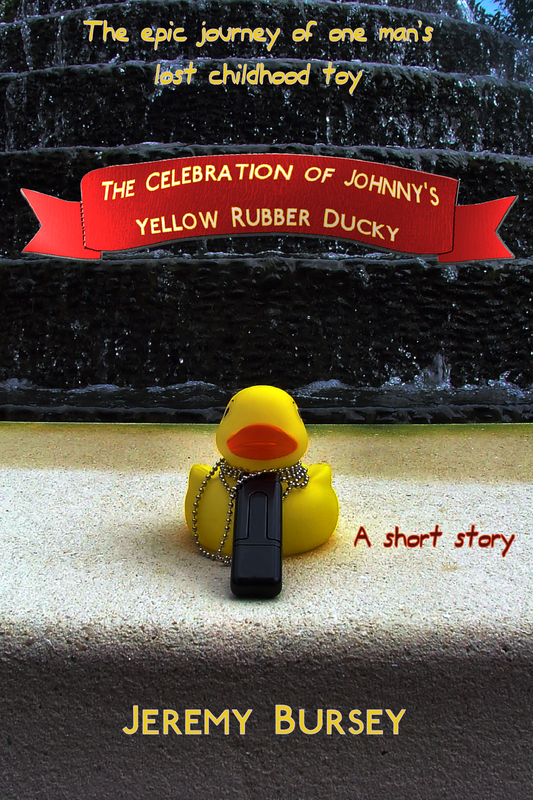 “The Celebration of Johnny’s Yellow Rubber Ducky,” the fifth free ebook based on one of my older short stories, is the story of seven people who have never met, but have all spent a brief season carrying around this rubber ducky while having an adventure or life lesson of their own. Look for it at your favorite retailer soon. Note: Smashwords will receive this ebook first. It will distribute to the other retailers throughout the week. All retailers should have it posted by August 13, 2015. At the end of his coursework at Oxford, Johnny reaches a point in his life where he does not know what more to do or where else to go. Sure, he has plenty of options, but with those options comes an endless chain of questions and decisions to make, and his mind locks up when he has to participate in too much of either. Even as he takes the Tube to anywhere, he wonders if he’s in control of his future, or if fate is pulling his strings. There have been plenty of moments in his life when he thought fate had smiled on him, especially the night he’d met Claire, but those moments just showed him that it was all one big tease and the future’s real plan was to pull the rug out from under his feet. The day after graduation, Johnny figures he should start pulling his own strings, so he considers speaking to a life coach to help him plan out his destiny. As he rides the train back to London, however, he discovers one new trick up fate’s sleeve, and it comes in the form of a yellow rubber ducky he finds on the floor under his seat. On this duck is a flash drive full of stories from people who have no connection to each other save for the one factor that they had carried the duck around during a brief season of adventure. The drive also contains an instruction: “To anyone who finds this, please take this rubber ducky wherever you go. At any point you should experience something great, I beg of you, write it down and attach it to the duck. Then, leave it for the next body to find. When the seventh individual writes his experience, keep the duck and publish the letters for all to see.” Johnny can already see the hand of fate trying to pull him back under its spell. But he takes the bait. He takes the duck with him. Six people have already written their stories. Johnny is the seventh and final person to take the duck on a new adventure and share it with the world. But how does one live through a story worthy of closing out the duck’s epic journey? How much of Johnny’s path does fate still influence? And why does the rubber duck seem so familiar to him?